Henri Murison, Director of the Northern Powerhouse, wrote to The Sunday Times regarding the ‘unacceptable’ delays and cancellations of Northern Rail services in the North of England. 71 Northern business leaders and council chiefs signed the letter. Other than Mr Murison, signatories of this letter included James Mitchinson, editor of the Yorkshire Post; Gary Neville, footballer; Chris Oglesby, CEO of Bruntwood; Roger Marsh OBE, Chair of Leeds City Region LEP; Sandy Lindsay, CEO of Tangerine Communications; and Henry Brookes, managing director of Tatton Estates. See the letter and full list of signatories on The Times website here. Over the past two weeks in the north of England we have seen an unacceptable level of cancelled and delayed trains. Travellers have missed vital appointments and been given written warnings at work; businesses have struggled to cope; and public services have been put under strain. The anger is mounting. The failure of Northern Rail to be ready for the new timetables, the delays to the completion of engineering works by Network Rail and the lack of government action have led to this debacle. We now call on the government to address it by granting Transport for the North (TfN) full powers to manage all northern infrastructure. Only by TfN being accountable for the performance of Network Rail and the train companies can the north truly take control of its own destiny. Without greater authority TfN will not be able to supervise delivery of the north’s first strategic transport plan and avoid repeats of the current fiasco. In addition, the government needs to work with Northern Rail to establish a comprehensive, straightforward passenger compensation scheme. This must happen now. Even when things return to normal, the railways across the Northern Powerhouse region are not good enough to attract investment and increase productivity at the pace required to ensure we become an equal partner in the UK economy. By the time of this autumn’s budget, we want the government to commit itself to implementing the TfN’s Northern Powerhouse Rail strategic outline business case in full, guaranteeing that northern businesses will secure growth and our children can use a fit-for-purpose modern rail network. For two years, Northern Rail has been preparing to deliver the ambitious plans for improved services they promised to the travelling public. Network Rail in January this year told them that a completely different set of changes would be ready in time for the proposed timetable changes, at that time four and a half months away. Northern Rail have let the travelling public down, but Network Rail in delivering schemes as directed by Department for Transport have also let the North, and as a result, the country down. The Transport for the North board were not involved in the process of holding Network Rail to account, and from what we can tell, no one held them to account for the mismanagement that took place. The executive power to hold Network Rail to account needs to be shared between the Secretary of State and the Transport for the North board – or eventually fully transferred to TfN. This crisis cannot be allowed to happen again. The detailed arrangements for making this change will be covered by a review being set up by Transport Minister, Jo Johnson, and Cllr Judith Blake, Leader of Leeds City Council and also an Associate Vice Chair of the Northern Powerhouse APPG as well as TfN Board Member. Finally, it is the case that Northern Rail are in breach of their franchise, a matter which the Secretary of State must now also address. During the last Government, The Northern Powerhouse concept was one of those ideas that really seemed to capture the imagination. It seemed to encapsulate a new energy and optimism about the north. The concept is very much still on the agenda, and recently we have seen three major launches bringing renewed energy to the project; the setting up on the APPG for the Northern Powerhouse, the recent report from the Northern Powerhouse Partnership on education and skills in the north, and the initial transport plan proposals from Transport for the North. The starting point for any debate on the Northern Powerhouse is: what is it? Is it an idea? Was it just George Osborne’s attempt to show the Tories cared about the North? Is it a chance to rebrand the North’s major cities? Is it about bringing the North’s leading politicians and industrialists together to help rebalance the United Kingdom’s economy? Following renaissance of our northern cities, we have moved into an era of growing devolution, with Metro Mayors providing the civic leadership. The Northern Powerhouse APPG meets throughout the year and campaigns for the North. 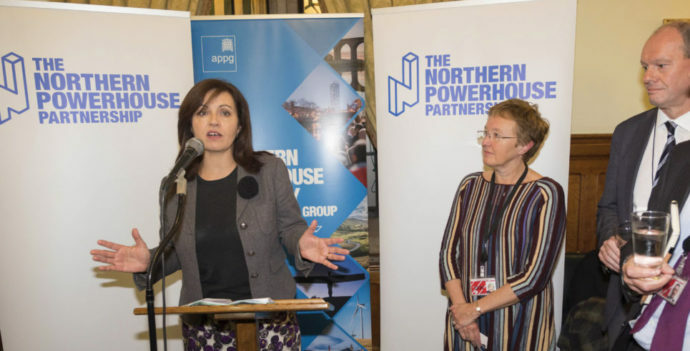 The Northern Powerhouse Partnership acts as the secretariat for Northern Powerhouse APPG. The aim of the Northern Powerhouse APPG is to bring together Northern MPs and Peers with the new Metro Mayors and key leaders – from local government, the private and third sectors – to give a strong political voice for policies which support the Northern economy and promote its potential as a place to study, work, live and invest.